With the announcement of the death of Ford sedans I thought it would be fun to look at the mid to full size market numbers for Ford. Some of these numbers were really conflicting and hard to find so if there are any mistakes feel free to point them out. Left out on this are the Panther sedans and the pre D186 Continental. Note 2007 Taurus is still D186. It's kind of amazing to see some of those numbers and where they stack. I tried to keep this list only to sedans and wagons of cars related to the Taurus. When you look at the totals you can see a pretty steady decline which is pretty depressing to see with the high being in 1996. 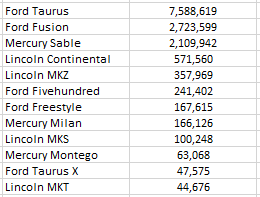 I broke the numbers up by platform too and obviously there are some platform mates missing like the crossovers for the C/D series, the Mazda variants and the Windstar for D186. falcon lover, 2b2, ZanatWork and 3 others like this. Last edited by Andrew L; 05-23-2018 at 09:17 AM. Thanks for putting that together - definitely is interesting to see. I know it takes a lot of time to put these together too. I just had to completely rearrange my Lincoln/Cadillac excel /charts because of GM's stupid switch to quarterly sales numbers - had to create quarter columns and redo all the references in the charts to account for quarterly and not monthly numbers. It was a pain! Andrew L and jpd80 like this. Yea I hear you I am upset GM has gone to quarterly cause it messes up all my charts I have too. ^ can we just ignore GM? Last edited by 2b2; 05-23-2018 at 05:38 PM. It took me hours to change it all up to quarterly. as pleasurable as seeing those zerØs may-or-may-not be, what about inserting either an Averaging/trending formula or just "n/a"
Well, I set the charts up once a year so that I don't have to go through and edit what they reference every month for new numbers (takes forever because I have to edit each field for each item I want to chart). With a blank field, it doesn't matter, it'll just ignore that value. But where they get screwed up is the quarterly setup with Ford still reporting monthly. So take Q2 for example - we've only had April in Q2 numbers. GM's numbers are at 0 because I have no info, which I can just leave those blank and it would ignore them. I built the Q# numbers to add the 3 previous columns/months in the Ford part since Ford doesn't report quarterly, I have to add them to get quarterly numbers to compare, so right now, Q2 only has ~1/3 of the numbers with only April in, which throws the line charts off (since I already built in the references for the year). Before it was fine because you'd have tallies for both companies for the month. Now you have one but not the other. Last edited by rmc523; 05-23-2018 at 04:08 PM. Nice job with the list! What this shows is the natural progression as more vehicle 'types' have become available. Initially there were only sedans as passenger cars, then wagons were added that shared consumers with sedans. SUVs shared more of the 'car' consumer base. Then the more car like CUVs/Crossovers came along and shared even more of the 'car' consumer base. This sharing of the SAME CONSUMER BASE requires the initial 'car' consumer volume to be reduced to allow for crossover and SUV sales. But that shift in consumer choice moves around a bit based on different variables. The shift from cars to higher margin SUVs swung back sharply to cars with the rise in gas prices. Automakers trying to hold on to some of that higher margin offered the crossover, which is just the car with a higher ride height, but still at a higher margins, along with similar fuel economy as the car. Now today as gas prices are creeping up again, crossover/SUV sales are beginning to flatten out. Just looking at Ford, SUV/Crossover sales were down -4.6% for April and -3.6% for the year. Just for an apples to apples comparison, in April the compact Escape was down -16.6% and -13% for the year, while the compact Focus at was down -1.5% and -3.7% for the year. Looking at other compact and midsize sedans, the new models are in a more positive position than the CUV/SUV model sales based on manufacturer. Which helps to explain why the old Fusion offers the one of the worst sales performances in the segment. It is the higher margins Ford is reaching for with crossovers/cars with higher seating position and lower fuel economy, but consumers are not obligated to fall in line with that plan. As Ford shifts to more expensive everything in each segment by calling them CUV/SUVs, the rest of the industry is renewing and adding more options in the lower priced, more efficient, better driving dynamics, easier to drive, car segments. With EVs just emphasizing the benefits of the car body style. As gas prices continue to rise, we will see if the trend of declining CUV/SUV sales continue, along with rising sales of the NEW sedans from other manufacturers. Perhaps this is the reason Toyota hasn't abandoned the sedan segment in the US. The Camry and Corolla will probably stick around for a while... they're even building the next Corolla sedan in the US. "Toyota’s Mississippi Plant Investments in Full Bloom"
Last edited by AM222; 05-23-2018 at 09:48 PM. The progression has probably more to do with more competition, than type.